From The Purple Wig – The Innocence and Wisdom of Father Brown by G. K. Chesterton. This book has 24 mystery short stories involving Father Brown a Roman Catholic Priest. The mysteries are wonderfully written and you find yourself admiring the wisdom and humility of Father Brown and his knack for solving crimes and mysteries. Good stuff! I highly recommend this book. Click the button for all the details! That’s a good idea. I love Father Brown, and sometimes have had a hard time finding many of the stories in our small library. PErhaps I need to visit the bookistore instead. 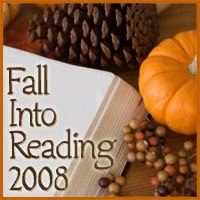 Thanks for the reminder of Fall into Reading. I plan to participate, but have a lot going on in the next week so I will be late showing up with a list. I have that book on my shelf but I don’t think I’ve ever read it – you’ve inspired me!